New video of a Sanctuary Pest termite inspection after prospective buyers found termites when the house for sale was being inspected. Since 1994 Sanctuary Pest Control and Termite Management has provided nil odour pest control and termite inspections for homes, businesses and strata plans throughout Byron Bay and surrounds from Ballina to Nimbin and north to Murwillumbah, Terranora and Banora Point. For those of you who discover termites in or around your house or have a neighbour with termites, we have Termite Treatments to eradicate the colony including the Queen as well as ongoing protection options. For peace of mind when purchasing property, we recommend our Pre-Purchase Pest Inspections.. Sanctuary Pest Control and Termite Management proprietor Michael Powell performing a pest inspection under the floorboards. Note the small bats he had for company! Problems associated with pests can be divided in two categories; (a) Health pests and (b) Economic pests. Termites for instance are economic pests causing upwards of thousands of dollars damage to a home. Cockroaches, rats and mice are health pests causing many forms of illnesses to people and pets through contamination of food, utensils and surfaces. Conversely, rats and mice are also economic pests responsible for gnawing through electrical wires, water pipes and food. Our Cockroach Treatments can be spray free as all we target are the cockroaches. There is no need to empty cupboards or leave the house as there is no unpleasant odour or spray drying time. In a business environment we can work around you with care so that there are no problems for you, your staff or customers. 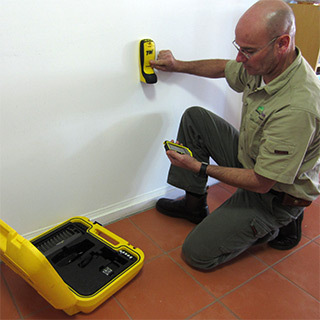 Some pests such as termites, rodents and product pests like meal moth and weevils cause economic damage that can run into thousands of dollars in repairs and product loss and in the case of the workplace, can cause failure of audits, breaches of regulations and unhappy memories for customers. It is important to us when managing and controlling these pests that it is done with minimal disruption to not only your home, family or business but the environment as well. This is what Sanctuary Pest Control and Termite Management does best and we can be relied upon to be there whenever you need us and have a solution to whatever your problem is! Phone or email us to make a booking or for any additional information you need in regard to pest control or termites around your home or business. You can reach us after hours. If you have found live termites do not disturb them.